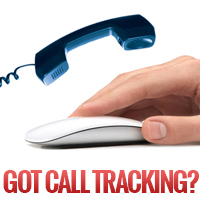 How Effective Is Online Advertising Without Call Tracking? Tracking conversions, analyzing performance metrics, and being able to optimize ad spend efficiently are important parts of PPC management for any Google AdWords or Microsoft Bing Ads campaign. Tracking conversions for an eCommerce client isn’t terribly difficult. You simply install a code snippet on the checkout success page of the advertiser’s website. That in turn allows conversions to be tracked for online sales. Now what about tracking conversions for service-based companies like attorneys, electricians, plumbers or computer technicians? The primary method of contact for service-based companies is overwhelmingly initiated by our old friend, the telephone. Accounts that do not track these valuable phone calls are not as effective as accounts that do have call tracking. Imagine if an eCommerce store only tracked 10-20% of its online sales. Business owners would be throwing their hand up, shaking their heads at the dismal numbers being posted month over month. They would almost certainly want to discontinue PPC advertising because of an extremely poor ROI. Not tracking phone calls is essentially the same as only tracking 10-20% of online eCommerce sales. Your ROI won’t look great on monthly reports, and it won’t help in gauging the overall success of a campaign. Google offers a few methods to help solve the problem of tracking phone calls: Call Extensions and Call Metrics. Having these important ad extensions enabled is highly recommended. Unfortunately, it still won’t help you track 100% of the calls that are being generated from the overall PPC effort. Ad Extensions are not eligible to show every time your ad is displayed. The unique Call Metrics phone numbers do not carry through to the advertiser’s website.